Turmeric is a member of the ginger family and its rhizomes add a golden colour to curries. It is a herbaceous perennial native to tropical Southeast Asia. It forms a dense clump of aromatic foliage to about 1m, spreading rhizomes that are brown with bright yellow flesh. The flowers are borne in dense spikes with yellow and white to orange tubular flowers. The leaves are simple and the lamina extends to the base of the stems. Turmeric requires a rich, moist soil and consistently warm temperatures in order to flourish. Plants die back underground each winter and will survive some frosts. Boil the rhizomes for several hours before drying and powdering. Buy plump, firm, clean rhizomes. They should have a warm, mild aroma and an earthy, musky flavour. 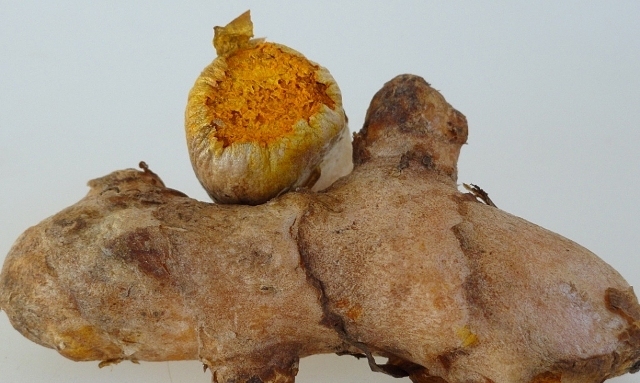 Turmeric can be used fresh or dried and ground, and adds a brilliant yellow colour to foods. It is used in curry powders and pastes, pickles and chutneys, vegetable, rice and lentil dishes (especially in India, where is often partners potatoes and cauliflower), and with poultry, fish and shellfish. It is also an ingredient in the Moroccan spice blend chermoula. Turmeric also contains many health benefits and is a powerful anitoxidant. I have started taking Turmeric capsules. I believe they are very beneficial to one’s health. This ingredient is growing on me. Great post! I take about 600 mg daily and you have me thinking that it might actually grow here. Please let me know if it does! I didn’t realise it was related to ginger! I’ve only ever used it powdered. Sometimes we get raw turmeric like that here! It’s so cool to see the spice in raw form. I wish I was able to get fresh tumeric reliably. It is so good for you anf in Balinese food it is absolutely necessary!! Maybe I will have to grow some?? Use a lot of this but hadn’t realsied it was part of the ginger family – how interesting!